With a park as large, diverse, and intricate as Canyonlands, we are sure you have some questions as to how this extraordinary landscape was formed. Check out our list below of fun and interesting facts about the park! How large is Canyonlands National Park? It’s huge! The four districts are approximately the area of 172,121 football fields! That is 227,598 acres. 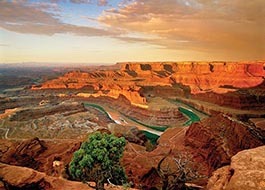 While the term ‘canyonlands’ is used to describe much of southern Utah, Canyonlands National Park has 4 distinct areas. 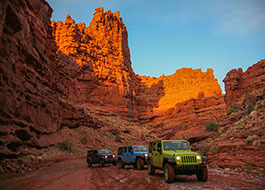 Island in the Sky is the closest section to Moab. 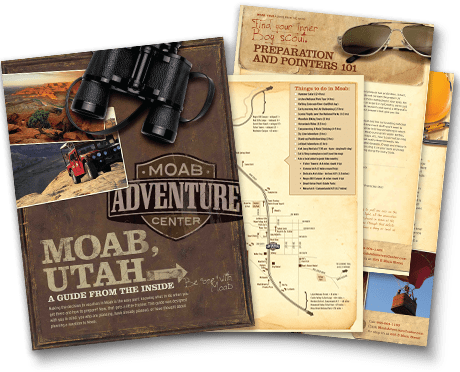 The Maze and Needles district are farthest to the west and south of Moab. 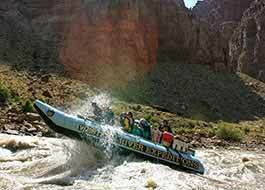 The Rivers section can be accessed via one of our multi-day Cataract Canyon Rafting adventures. What is the highest elevation in Canyonlands? The highest point of elevation in Canyonlands is at Cathedral Point in the Needles District at 7,120 feet (2,170 meters). What is the lowest elevation in Canyonlands? The Big Drop Rapids section in Cataract Canyon on the Colorado River at 3,700 feet (1,128 meters). Join us on our multi-day Cataract Canyon river rafting to see this beautiful and exciting area of the park. Who was the first person to raft Cataract Canyon on the Colorado River? John Wesley Powell led the first known successful rafting expedition in wood boats in 1869! When did Canyonlands become a national park? In the 1950s and 1960s, the then Arches National Monument superintendent, Bates Wilson, advocated for the area that is now Canyonlands to become a national park. After leading government officials in jeep tours that included long discussions over campfire dinners, Wilson successfully won over Secretary of the Interior Stewart Udall who brought the campaign to Washington D.C. In 1964, President Lyndon Johnson officially established Canyonlands as a National Park. Have people lived in Canyonlands? 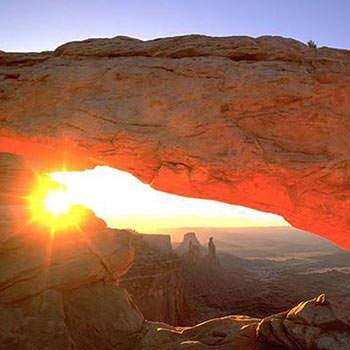 The first people to visit Canyonlands was over 10,000 years ago. Though it appears they didn’t stay in the area for long, they left behind amazing rock art that can still be seen in the park today. About 2,000 years ago, the hunter-gatherer ancestral Puebloans occupied areas of The Needles District, though many granaries and dwellings can be found in various parts of the park. Early European settlers are recorded to have only passed through the areas that now make up Canyonlands. Who’s the most notorious person to visit Canyonlands? We’d like to say Thelma and Louise… but if we’re talking non-fiction, we’d say Butch Cassidy. The Robber’s Roost hideout of Butch Cassidy’s Wild Bunch gang was located near the Maze District of Canyonlands. Where any movies filmed in Canyonlands? The famous ending scene of 1991 “Thelma & Louise” was filmed above the Colorado River in Canyonlands National Park. “127 Hours,” starring James Franco, tells the story of Aron Ralston who got stuck in a slot canyon in the Maze District and had to self- amputate his arm to get free. What rivers go through Canyonlands National Park? The Green River and Colorado River run through Canyonlands National Park, separating the park into 4 districts. What plants are in Canyonlands? Indian ricegrass, galleta, grama, and needle and thread are abundant in the park, as these grasses don’t require much water to thrive. Blackbrush, shadscale, and squaw tea are also prevalent throughout the park. Cottonwood, willow, and tamarisk thrive along the Green and Colorado rivers’ banks. What kind of reptiles can I see in Canyonlands? Canyonlands is home to a variety of snakes and lizards, including the side-blotched lizard,the northern whiptail lizard, as well as the more rarely seen midget-faded rattlesnake. You’re most likely to spot a lizard on your visit to Canyonlands, as they prefer to be out during the daytime and sunbathe on the rocks. Upheaval Dome is a geological formation found in the Island in the Sky district that is 3 miles (5 km) across. While most of Canyonlands’ geological history is clear, Upheaval Dome has left geologists debating whether it’s a crater was formed by a meteorite impact or the remnants of a salt dome. What kind of mammals will I see in Canyonlands? The most commonly seen animals are desert cottontail, kangaroo rats, and mule deer. Most mammals in the park are inactive during the day, so they may be tough to spot. The extreme heat and lack of water in the high desert climate tend to favor small animals since they have an easier time finding food, water, and shelter. The park has over 60 species of mice and rat! Will I spot a bear in Canyonlands? It’s uncommon to see a black bear on the red rocks They are active during the fall along the river and stream corridors closer to the Needles District of Canyonlands.